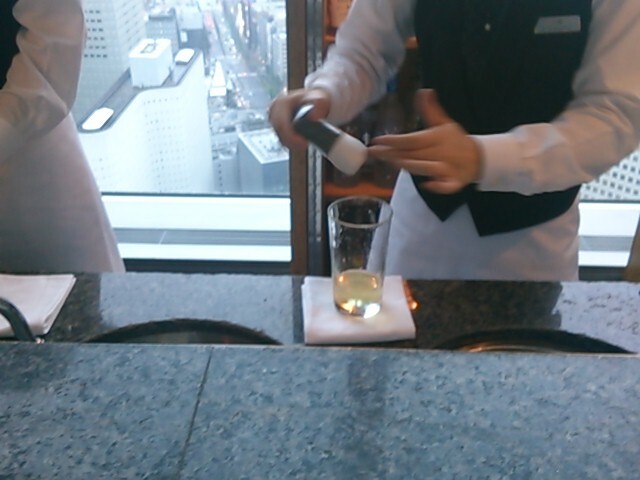 The people behind the Park Hyatt Tokyo Twitter account can be very persuasive. 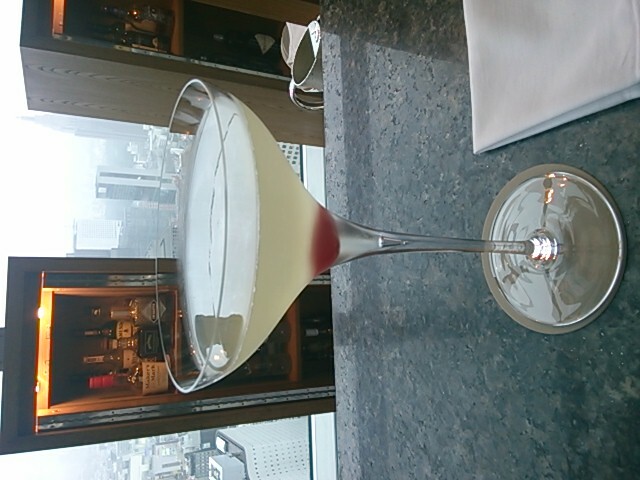 I’m still not exactly sure how it happened, but somehow they got me to promise them that I would come by and try out their new “Timeless Passion” cocktail at the Peak Lounge, created in celebration of the Park Hyatt Tokyo’s 20th anniversary. And so tonight I did! The Timeless Passion, as described on their website, is “Fragrant yuzu-infused vodka (like the Park Hyatt Tokyo Yuzu bath salt that you can win in my contest), lush Aomori apple juice, Yamanashi sparkling wine, and a dash of Japanese pepper for warmth.” It was all made right in front of me, with the stormy skies of today’s Shinjuku in the background. That white building is the Washington Hotel. I stayed there once, and have absolutely no recollection of it. 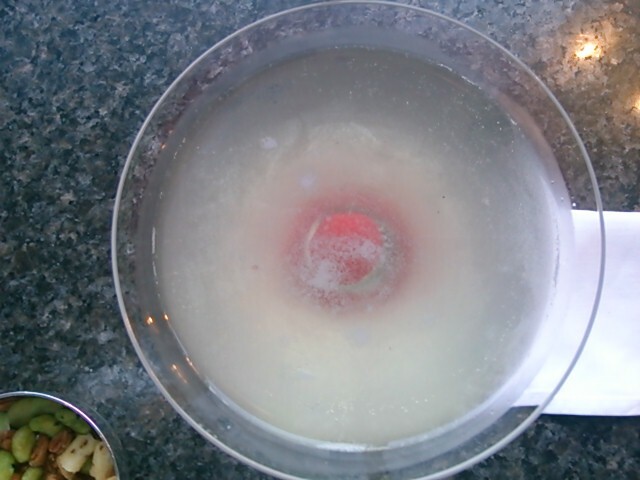 After about three minutes, this concoction was set down in front of me. The cherry sinks like a rock. 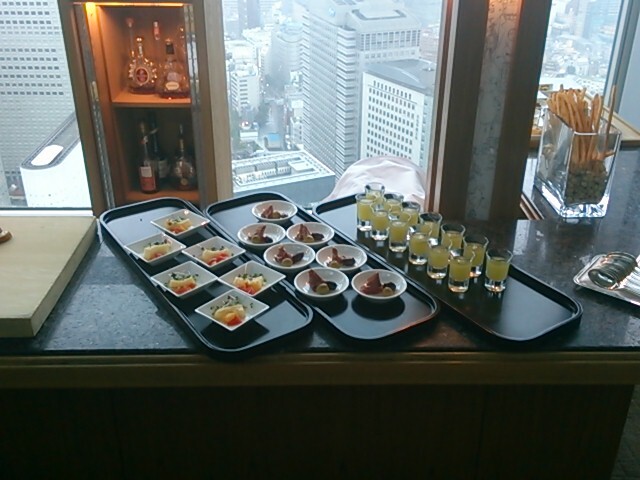 The yuzu and apple complemented each other quite well, and the Japanese pepper serves to warm the body more than vodka alone would do. It was a complex drink, kind of like pearls before swine for someone like me that rarely imbibes, but I enjoyed the experience just the same. Actually I enjoyed looking at it almost as much as drinking it. Though the picture doesn’t do it justice, the birds eye view looked a lot like several nebula floating in a pale white space landscape. I don’t know if they intentionally made it look like that, but it was a very cool effect. 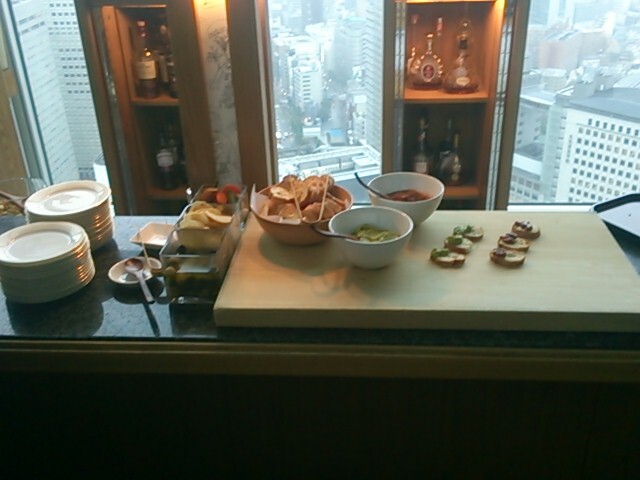 Alas, all that was offered to me this time around was some beer snacks. 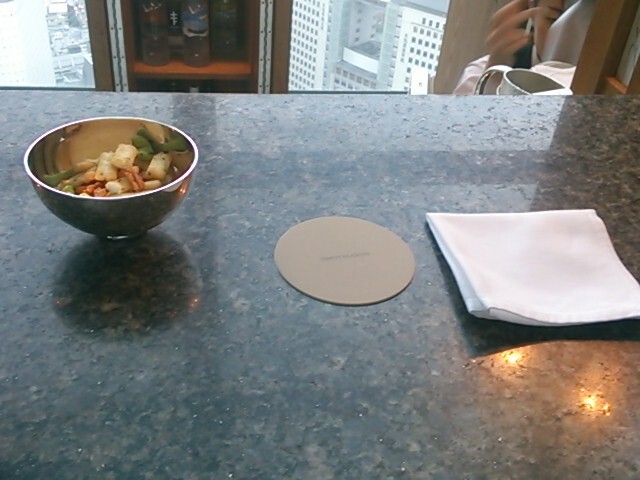 Once again, I’d like to thank the folks at Park Hyatt Tokyo for getting me out of my comfort zone to try something new. 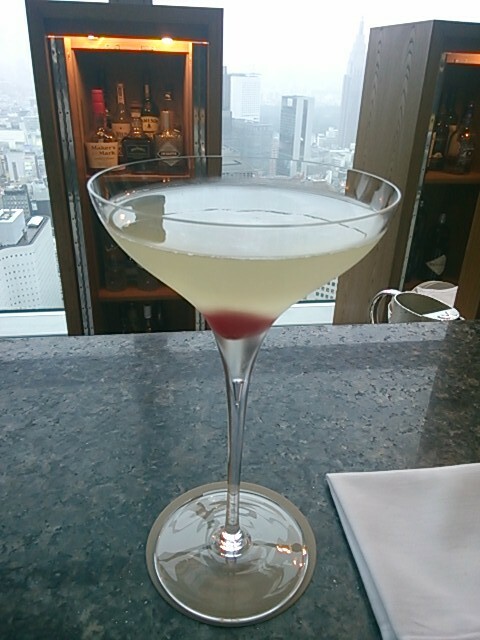 If you are the kind of person that spends 2440 yen on a cocktail without thinking twice about it, then you should really give the Timeless Passion a try. As for me, I will probably save the next Peak Bar experience for Twilight Time, when I can fill up on tasty appetizers, get drunk on sparkling wine, and then head off to Club on the Park to get drunk on shampoo and body soap. 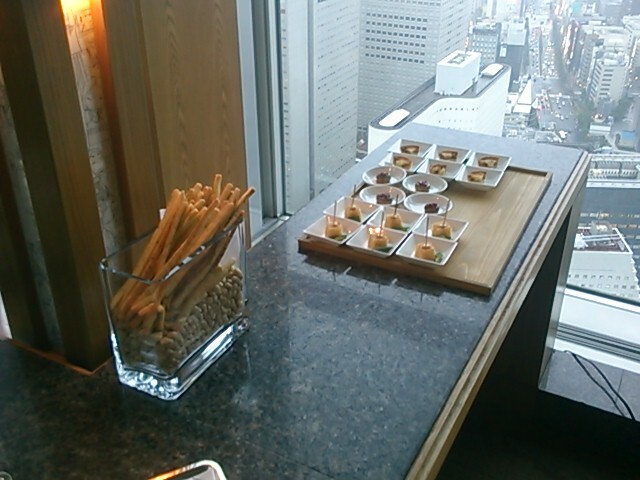 This entry was posted in Uncategorized and tagged food and drink, Park Hyatt Tokyo. Bookmark the permalink. I’m commenting here because I don’t see another place to contact you. Can you email me directly? I have a question for you! Thanks!